Comfortable nasal breathing is a sign of a healthy breathing pattern. A blocked nose is one of the most common indications of a dysfunctional breathing pattern. Mouth breathing is a slippery slope and what may start as a symptom of seasonal allergies or a cold can quickly develop into a permanent situation. When mouth breathing is the norm, the nasal passages tend to block: a case of use it or lose it. Chronic nasal congestion and habitual mouth breathing may exacerbate asthma and hay fever and are linked to dental problems including crooked teeth, narrow airway and jaws. Chronic nasal congestion is linked to loud snoring and uncorrected can develop into more serious conditions like sleep apnoea. Physical obstruction (for example, deviated septum). 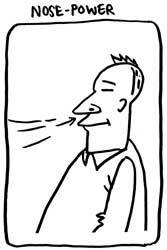 It is widely accepted that people suffering from nasal congestion tend to be habitual ‘mouth-breathers’. However, contrary to popular thinking, habitual open-mouth breathing may in fact be the reason for the nasal congestion in the first place. Inflammation of the nasal passages, constriction of smooth muscle lining the nasal passages and even outgrowths from the nasal mucosa such as nasal polyps may in fact be a response to the dysfunctional breathing pattern. In other words, inflammation and constriction of the upper airway is happening in response to the underlying problem: over-breathing. The Buteyko clinic programme relieves nasal congestion by helping restore a normal breathing rate and volume. Inflammation and mucus production reduce as breathing volumes normalise. In addition to this restoring natural CO2 levels in the nasal passages helps soothe nasal membrane tissue and dilates smooth muscle lining the nasal sinuses. Note: Reduction of nasal polyps may take 2-3 months of dedicated practice in severe cases. In a small number of cases surgery might be required where nasal blockage is due to injury. However, from my clinical experience nasal breathing can be restored without recourse to surgery. Hyperventilation syndrome (HVS) should be included in the differential diagnosis of patients presenting with nasal congestion, particularly after failed nasal surgery. Additional surgery may not necessarily be the answer in HVS patients complaining of nasal congestion.